The family of a mentally disabled Black man unjustly accused of carjacking and fatally shot by L.A. County Sheriff Deputies in Compton held his funeral services in Inglewood on Aug. 16. Donnell Thompson Jr.’s family has filed a wrongful death lawsuit, and plans to file a federal lawsuit in September, according to reports. His family said police treated him worse than an animal in their rush to judgement. They appealed to L.A. County Supervisors during the body’s Aug. 9 to hold the Sheriffs Department accountable. 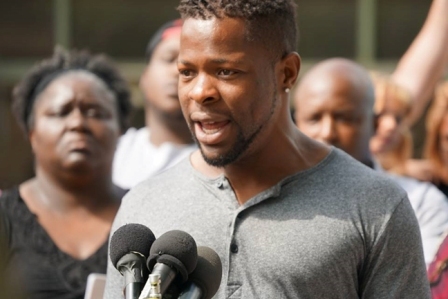 Police killed an innocent man, Thompson’s family lamented in a press conference afterward. “I’m tired of hurting. I’m tired of crying,” said Lamar Avila, Thompson’s cousin. “I’m emotional. It affects me at work,” he said, as he pled for the truth about what activists dubbed an unjustified, merciless killing on July 28. Police concluded Thompson was one of two suspects in an armed carjacking in L.A. the night before. After deputies spotted the car in Compton, a chase ensued. Deputies alleged they were fired on, and when the car crashed, suspects fled into a neighborhood. Police in armored vehicles and paramilitary gear took to residential streets and saw Thompson laying down in a neighbor’s yard after being alerted by a 911 call. According to police, one of the 27-year-old’s hands was hidden under his body. They first hit him with rubber bullets, then a deputy fired after he supposedly charged them. Activists argued police shot Thompson after their flash bang devices and rubber bullets caused him to run. “Bo Pete’s personality is introverted, quiet, shy, almost easily intimidated, and a little bit on the withdrawn side. I think him even hearing the sounds of cars and helicopters probably frightened him,” said Dawn Modkins, an organizer with Black Lives Matter Long Beach. She believes the Sheriffs Department’s approach of military tanks, bright lights, sirens and whatever else they may have used terrified Thompson and caused him to freeze up. That is his coping mechanism, his go to place, according to the activist. She said witnesses have indicated police made no command until after they hit Thompson with a flash bang grenade, which frightened him even more. “Then he finally does proceed to stand, and according to witnesses, he’s looking a little dazed, confused, just blasted with rubber bullets, maybe couldn’t hear with that loud grenade they let off. They said he was kind of stumbling and proceeded to walk away, and then they killed him,” Modkins told the Sentinel. Judged, tried and executed on the spot without question, and Thompson was completely innocent. According to the Sheriffs Department, deputies took Robert Alexander into custody for the crime after a house-to-house search without incident. Thompson, they shot first and sought questions about later. He was soft-spoken, kind and gentle, and was a threat to no one, his family said. “I’m hurt. I wonder why they had to take someone very special to me,” said Antoinette Brown, Thompson’s sister. “Black Lives Matter. 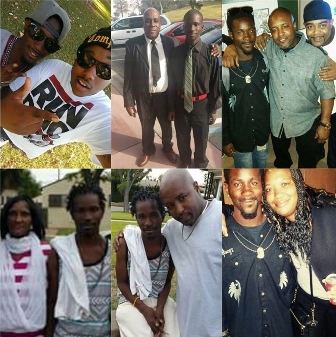 I just want justice for my baby brother,” Brown stated. Captain Steven Katz of the L.A. County Sheriff’s Homicide Bureau admitted their deadly error. “We have no physical evidence that connects Mr. Thompson to the carjacked vehicle or to any assault by gunfire on our deputies,” Katz revealed in an August 8 press conference. For weeks Thompson’s family practically pleaded for answers as to why police shot their beloved. Katz said the Sheriffs Department wanted to provide answers to Thompson’s family and an investigation was underway. “We want what we want … What's the hesitation? What’s the hesitation? What is there to cover? What is there to cover? Why does it have to be this drastic,” Avila questioned. Thompson’s family has said the Sheriffs Department was not being forthright about the facts. What they had been hearing was not true, Avila said. According to reports, their lawyer, Brian Dunn of the Cochran Firm, has questioned how one of two of the shots were fired into Thompson’s upper back, though police said he charged them. “Around the world, Black people are demonized. We’re already judged by law enforcement before they know who we are,” she said. “He by then was judged, criminalized, devalued before they even knew who he was, calling him a carjacker, a thief, a suspect,” she said. Katz and Sheriff Department press releases detailed steps of its investigation, methods used and persons or entities investigated to draw its conclusion Thompson was innocent. Investigators used gunshot residue testing, DNA, interviews with witnesses, deputies, and family members, latent fingerprints, and a special session of the Department’s Critical Incident Review Committee was also held. Modkins attributed that to the Thompson family’s unity, legal and political organization, and their quickness in applying pressure on the Sheriffs Department in many ways. They forced them to have to admit they were wrong in devaluing and killing him, she noted. “They do that publicly and immediately in the media as soon as they commit these acts, try to win their case in the media to save themselves every time, but what’s interesting about their admission is this evidences how they drag out other cases,” she said. Meanwhile, Black Lives Matter Long Beach has issued an invoice to L.A. County Sheriff Jim McDonnell for Thompson’s funeral service expenses. The bill is to really shed light on the need for reparations law enforcement owes to the families for harm caused by the state Modkins explained. However, reparation goes beyond paying for funeral services, she said. It is about their families, children, and communities and law enforcement’s guilt of causing trauma and dehumanization. “They left his body lying in the street naked and uncovered until in the dark evening … What message are they trying to send to our community when they do that,” Modkins questioned.